We took Mr. and Mrs. Shepley for their first view of the house. They were in raptures over it. Mr. Shepley said we were the first clients he had ever envied – but he would like to live in the house. We left the carriage at 16th St. and walked down to look at it. We took down champagne and Italian bread to christen the house and have our first meal there. We went all over the house. Then to Field’s to see our rugs and some embroideries – then we dropped Mr. and Mrs. Shepley at the Richelieu. This evening, December 12, 2011, sixty members, friends, and volunteers of the museum gather for a “re-christening” dinner to mark this notable event in the history of the house. A full dinner, including champagne, will mark the occasion, after which William Tyre, Executive Director and Curator, will give a talk on the life and accomplishments of John Jacob Glessner. 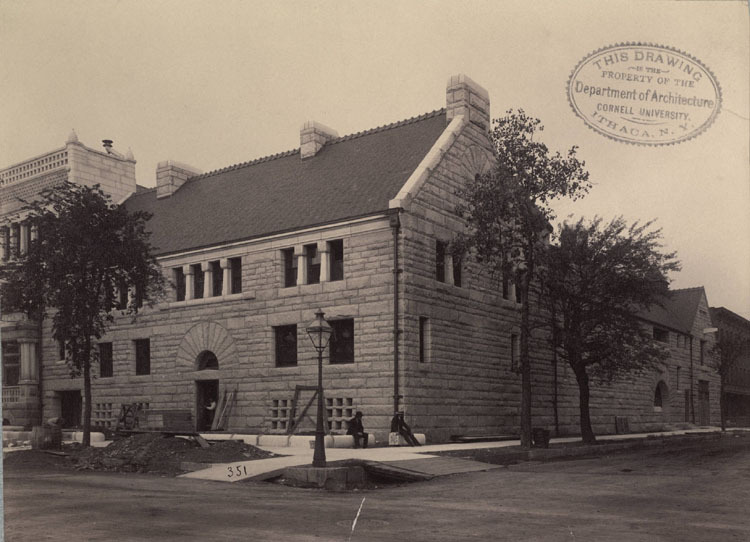 The celebration of the 125th anniversary of the building of Glessner house will continue throughout 2012, culminating in December, when we mark the anniversary of the family moving into their beloved home. On Saturday December 10 and Sunday December 11, the Glessner and Clarke House Museums will hold their annual Candlelight Tours. These tours, held at 5:30 , 6:00 , and 6:30pm , focus on Christmas traditions and decorations of the mid- to late-nineteenth centuries. A popular event for many years, the tours allow visitors the opportunity to experience the museums from a different perspective and explore how 19th century families celebrated the holiday. The Clarke House interpretation is based on extensive research of the period, whereas the Glessner House focuses heavily on the documentation left behind by Frances Glessner in her journal. 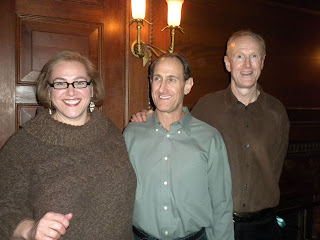 Reservations are required for the tours, call 312-326-1480. A highlight of the Glessner tour is the schoolroom, a space designed specifically for the Glessners’ two children, George and Fanny, who were 16 and 9 respectively when they moved into their home in December 1887. Since the celebration of Christmas in the family revolved around the children, it is not surprising that the decorations were largely confined to this space in the early years. The room is decorated with a small table-top tree, very similar to a tree the Glessner children decorated in 1888. Such trees were common at the time, and preceded the larger trees which stand on the floor and became popular by the early 1900s. Homemade ornaments including a tin foil wrapped bird and gold painted walnuts were typical decorations. Surrounding the tree are gifts typical of what George and Fanny received through the years – a toy stove, a train, metal soldiers and Indians, books, a scarf and mittens, oranges (a luxury food item at the time) and a set of dominoes, the latter of which were made for John Glessner’s company, Warder Bushnell & Glessner, and distributed as a promotional item. 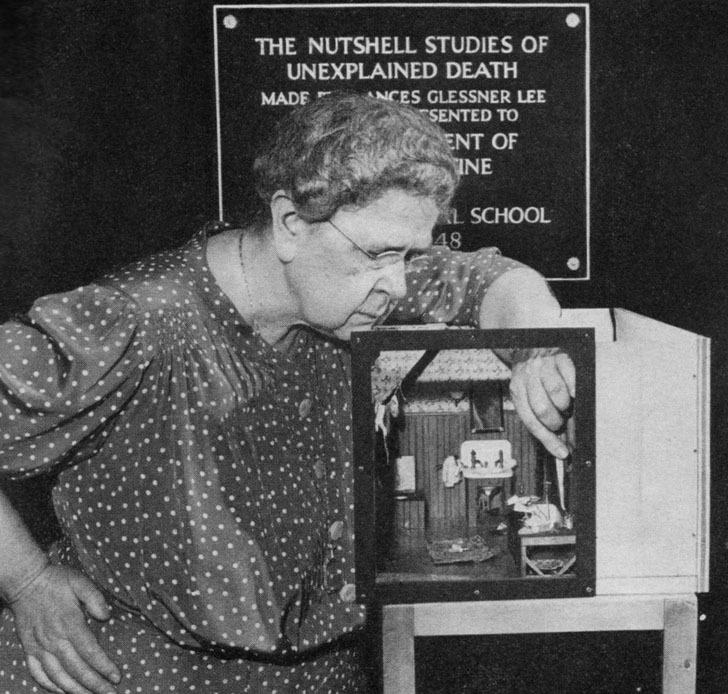 On Thursday December 1, 2011 at 7:00pm , Corinne May Botz, author of The Nutshell Studies of Unexplained Death, will present a free lecture on her research and photographs of Frances Glessner Lee’s amazing Nutshell Studies in the coach house of Glessner House Museum, 1800 S. Prairie Ave., Chicago. The program is being held in conjunction with the Crime UnSeen exhibit at the Museum of Contemporary Photography at Columbia College Chicago. Botz’s work is included in the exhibition, which runs through January 15, 2012. For more information, visit www.mocp.org. 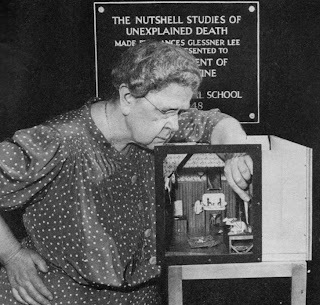 Frances Glessner Lee (1878-1962) became interested in legal medicine through her friendship with Dr. George Burgess Magrath, a classmate of her brother George at Harvard. She enjoyed listening to his stories of cases where his skill as a medical examiner helped to uncover the true cause of unexplained death. During his career he personally investigated 21,000 deaths and testified at more than 2,000 court cases. In 1932, Lee gave a gift of $250,000 to Harvard University for the creation of a chair in Legal Medicine in the Medical School. 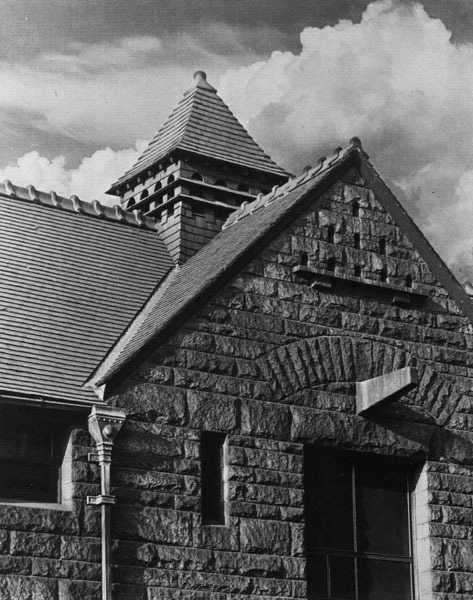 The endowment ensured the perpetuation of the department in which Dr. Magrath had taught since 1907. Two years later, Lee presented the school with a library of over 1,000 volumes, which was dedicated as the George Burgess Magrath Library of Legal Medicine. The library, unique in the United States at the time, was assembled personally by her and contained many rare volumes, some dating back to the 15th century. Her continual involvement in legal medicine led to her appointment as a State Police Captain in New Hampshire in 1943, one of many titles that would eventually be bestowed upon her. For the remainder of her life, she was known affectionately as “Captain Lee.” At the time of her appointment, she was the only active female state police captain in the country. She subsequently became the first female member of the International Association of Chiefs of Police. It was at this time that Lee came up with the idea of creating a series of eighteen miniature rooms depicting crime scenes to be used for the study and analysis of evidence by state police officials. Known as the Nutshell Studies of Unexplained Death, the name was derived from an old police saying, “Convict the guilty, clear the innocent, and find the truth in a nutshell.” The models were meticulously created on the scale of one inch to the foot. Doors swung on tiny hinges, windows moved up and down, and a minute mousetrap in the corner of one room operated like the real thing. Each room took about four months to build in an elaborate workshop set up in her home. Many of the pieces were crafted by her own hands; other portions were constructed by Ralph Mosher, a carpenter hired full-time to work on the project. The models were composites pieced together from different cases. Everything shown had actually happened, albeit under other circumstances. Some portrayed murder, others accidental death or suicide. In conjunction with the models, Captain Lee initiated biannual seminars in homicide investigation. State policemen from around the country vied for the opportunity to attend the seminars. Outstanding speakers in the field of legal medicine were brought in to lecture, and a major component of each seminar was the analysis of the “Nutshell Studies.” Attendees were given 90 minutes to analyze the minute clues hidden in each model, and then present their findings. Graduates of the seminars became Harvard Associates in Police Science, a distinction they would use when testifying in court cases. Captain Lee planned an elaborate banquet at the conclusion of each seminar, held at the Ritz. A typical banquet would run $3,000, with the dinner served on a set of gold-leafed china made especially for her use. In August 1883, John and Frances Glessner and their children George and Fanny moved into their new summer home, which they called the “Big House” at their estate “The Rocks” in the White Mountains of New Hampshire, mid-way between Littleton and Bethlehem. The Glessners had first considered the White Mountains for their summer home at the suggestion of George’s doctor, who indicated that George might experience significant relief from his severe hayfever by leaving Chicago and traveling to this part of the country. 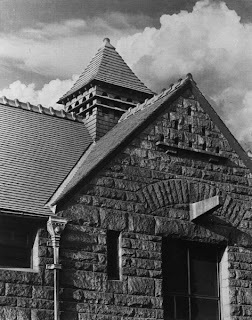 When George first visited the White Mountains in 1878, the relief was dramatic and immediate, so the Glessners opted to make the locale their annual destination. The Glessners continued to make The Rocks their home every summer until their deaths in the 1930s, and both George and Fanny later made the estate their permanent home. A portion of the estate at the western end of the property is still in the possession of two descendants of George Glessner, making six generations of the family to call The Rocks home. In 1977, two of the Glessners grandchildren, John Glessner Lee and Martha Lee Batchelder, made the decision to donate the majority of the property (1333 of the approximate 2000 acres assembled by their grandparents) to the Society for the Protection of New Hampshire Forests. The Society had been formed in 1901 to acquire and protect forested lands throughout the state in response to widespread clear-cutting being undertaken by farmers. 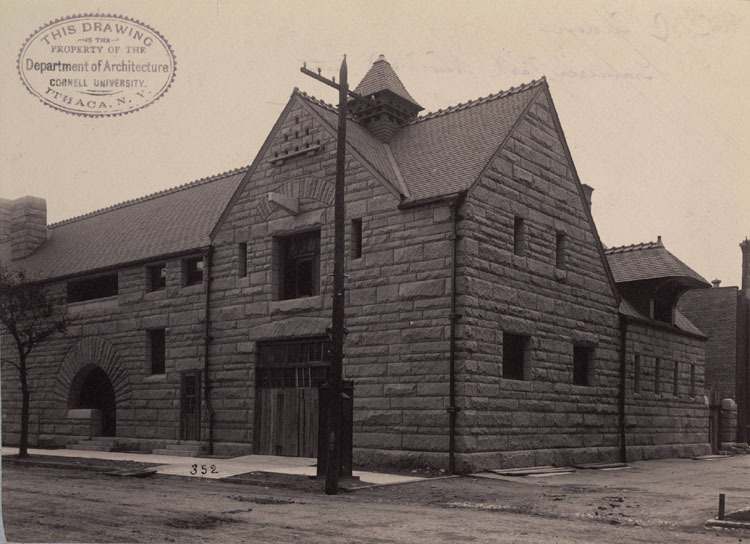 John Glessner was a strong supporter of the Society and joined in 1903, just two years after it was founded, so it was a very appropriate choice for the grandchildren to present the organization with The Rocks property. The estate includes numerous original buildings constructed by the Glessners from the 1880s through the 1910s designed by Isaac Scott, Hermann V. von Holst and others, as well as more than 500 species of trees and other plants. The Rocks Estate is supported in large part today by its use as a Christmas tree farm, which satisfies one of the stipulations of the gift requiring the Society to keep an active crop growing on the estate at all times. Open to the public year round, the estate also offers a number of hiking trails and other activities which help visitors to explore the vast beauty of the property. Visit http://www.therocks.org/ for more information. Glessner and Clarke House Museums will be decorated for Christmas from Wednesday November 23rd through Saturday December 31st. A special part of the holiday tradition at the museums is our annual Candlelight Tours, scheduled this year for Saturday December 10 and Sunday December 11. During these special tours, attendees will learn about Christmas traditions of the mid- to late-19th century and see both houses decorated in historically appropriate fashion. 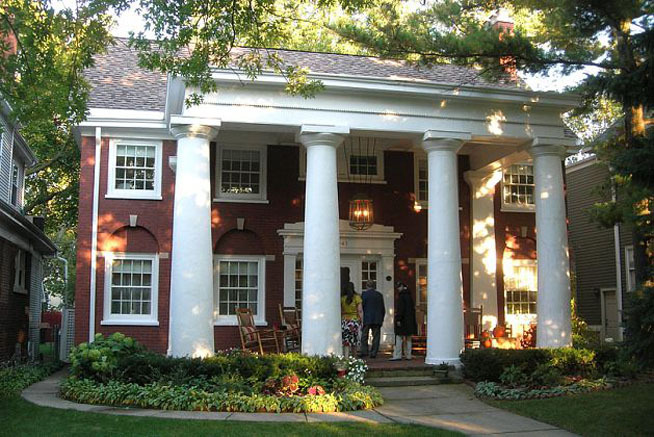 Afterwards, participants are invited to the nearby Wheeler Mansion for refreshments. 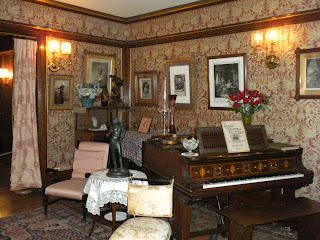 For more information, visit http://www.glessnerhouse.org/Events.htm , or call 312-326-1480 to make reservations. 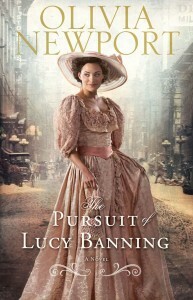 Prairie Avenue is due to receive some well-deserved attention with the release of a novel, The Pursuit of Lucy Banning, in June 2012. The volume, book one of three in the “Avenue of Dreams” series, has just been added to the online catalog of the publisher, Fleming H. Revell. The title character in the series, Lucy Banning, was born on October 8, 1871 (the same week as George Glessner, and also the date of the Great Chicago Fire), and is turning 21 at the time the novel opens. Banning has enjoyed the privileges of a Prairie Avenue upbringing, but yearns for more than a life of ease and the obligatory marriage to a banker that her family expects. Although the story is fictional, it is deeply rooted in the history of Prairie Avenue, with countless references to the actual people who lived on the street during its heydays in the 1890s. Just like Arthur Meeker’s fictional Prairie Avenue, which was published in 1949, the novel brings to life the “sunny street that held the sifted few” during one of the most remarkable periods in Chicago’s history, including the World’s Columbian Exposition. 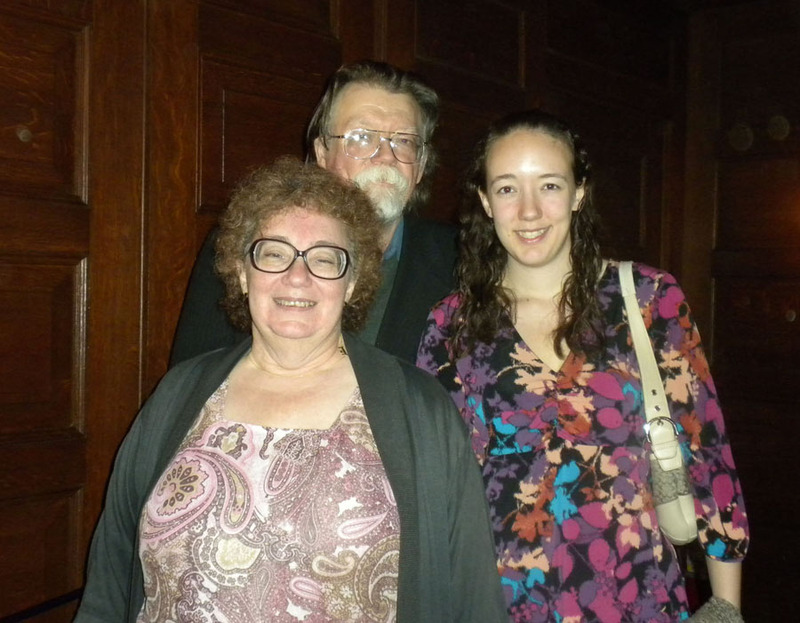 The series was conceived by Glessner/Clarke House docent Stephen Reginald in collaboration with author Olivia Newport. Reginald did the research (including frequent inquiries to the Glessner house), and Newport did the writing and character development. A release party and booksigning will be held at the museum in June 2012. If you are a fan of Prairie Avenue and Chicago history, this novel is sure to appeal to you. One of the many interesting architectural features of the Glessner house is a pair of dovecotes at the west end of the building over the coach house. A dovecote is a structure built to house the nests of pigeons or doves. It can be free-standing or built into the end of a house or barn. The use of these structures dates back many hundreds of years to a time when pigeons and doves were an important source of food (both flesh and eggs) and dung, especially in Western Europe. Although the Glessners left no record as to why they had the dovecotes incorporated into the design of the house, an analysis of their structure from the inside clearly indicates that they were functional, and not merely architectural ornaments. During the summer of 2011, museum volunteer Robert Herbst explored the attic space over the coach house to see how the dovecotes were constructed. The dovecote built into the north facing gable, which consists of nine openings, is accessed from the inside of the coach house by way of a small staircase. The openings measures 5-1/4” wide by 9-1/2” high and are 23 inches deep. A sliding wood door measuring 8” by 11” inches provides access to each opening. 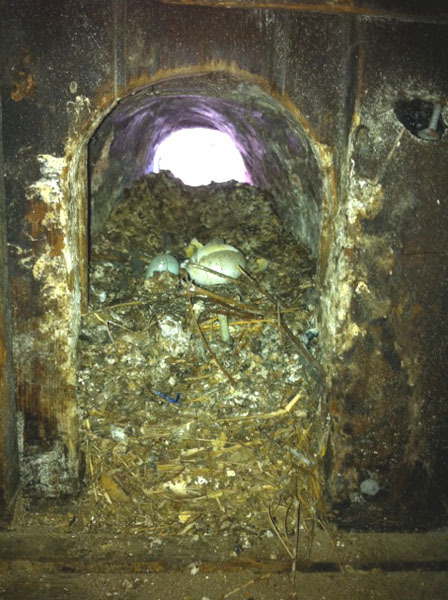 Several were found to still contain significant amounts of nesting materials and even egg shells. The four-sided dovecote located at the peak of the roof over the coach house is much larger with 48 openings. This appears to be more of a “communal” dovecote with all of the openings accessing the interior of the dovecote, which has perches. This dovecote is virtually impossible to access from the inside of the coach house due to the beams forming the structure of the gables, indicating that this one was not accessed by humans on a regular basis. It is also unclear how the pigeons and doves were prevented from flying into the main attic space. Although some questions remain about these structures, they are an interesting element in the design of the house. Be sure to look at them closely on your next visit. On Friday evening October 14, 2011, the restored parlor was officially unveiled to the public. Over 70 members and friends of the museum were present to witness this long-anticipated event. Following is the text of the speech prepared by Executive Director William Tyre which was read just prior to the opening of the parlor doors. In November 2007, exactly one month after starting my position as executive director at the museum, I received a letter and a donation check from long-time docent and supporter Aileen Mandel. In that letter Aileen expressed her wish that the museum would at long last undertake the important restoration of the Glessner parlor. I immediately contacted Aileen, whom I had known for many years, to enthusiastically let her know that I too had a dream of seeing the parlor returned to its stunning 1892 appearance. Over the next year and a half, two grant proposals were written to underwrite the project but were not accepted. When Aileen lost her courageous battle with ovarian cancer on June 13, 2009, her children designated Glessner House Museum as one of the organizations to receive memorials. I quickly contacted Aileen’s daughter Ruth, explaining her mother’s particular interest in the parlor, and asking if we could designate memorials toward the project. She enthusiastically agreed, and the fund grew. Less than a year later, on May 20, 2010, one of our “charter” docents, Bunny Selig, passed away, leaving a sizable unrestricted bequest to the museum. A second bequest was directed to the museum in honor of her long-time friend Robert Irving, with whom she had completed the first docent class in 1971. Bunny had often commented on how horrified Frances Glessner would have been to know we were showing her parlor in such an altered state, so immediately the idea came to mind to use these generous bequests to at last undertake the parlor restoration. The Board of Directors quickly agreed and work began on a year-long project culminating in tonight’s event. The undertaking was complex – this was not the restoration of just another 1890s interior – it was the recreation of a very specific space designed to the particular taste and sophisticated aesthetic of the Glessners. Fortunately, through photographs and written documentation, we knew a great deal about how the space looked. The Grammar of Ornament, a Denver-based company specializing in the recreation of historic interiors, had been contracted by the museum in 1991 to create a sample of the 1892 wall covering designed for the room by William Pretyman. You will all recall that sample which hung in the parlor over the doorway to the dining room. In 2010, I called Ken Miller, principal in the firm, to let him know that at long last we were ready to proceed! Fortunately Ken was a patient man, and had carefully kept the files and information ready, hopeful that someday he would have the opportunity to create this unique wall covering. He and his assistant Linda Paulsen meticulously examined an original fragment and historic photographs to determine the intricate process behind the original wall covering. You will hear more about that and about William Pretyman a little later this evening, when our own John Waters presents “Where’s William: In Search of William Pretyman” back in the coach house following the dedication. 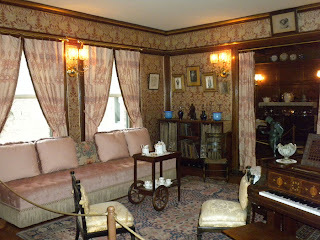 Another major element of the parlor design was the beautiful Kennet draperies designed by William Morris. An original fragment of one of these drapery panels survived in the Textile Department of the Art Institute of Chicago. This piece was carefully examined to determine the beautiful and rich colors. Since the fabric was no longer being produced, we turned to David Berman of Trustworth Studios in Plymouth Massachusetts to bring together 19th century design with 21st century technology. Using a digital process, Berman reproduced the intricate pattern and five colors, producing a fabric that is true and accurate to the original. 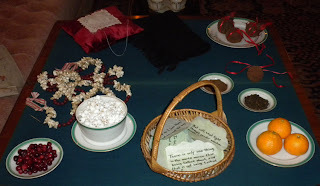 Our own assistant curator, Becky LaBarre, did all the sewing for the panels. A major piece of furniture for the room had been removed over 100 years ago – the large banquette which occupied much of the south wall of the room. 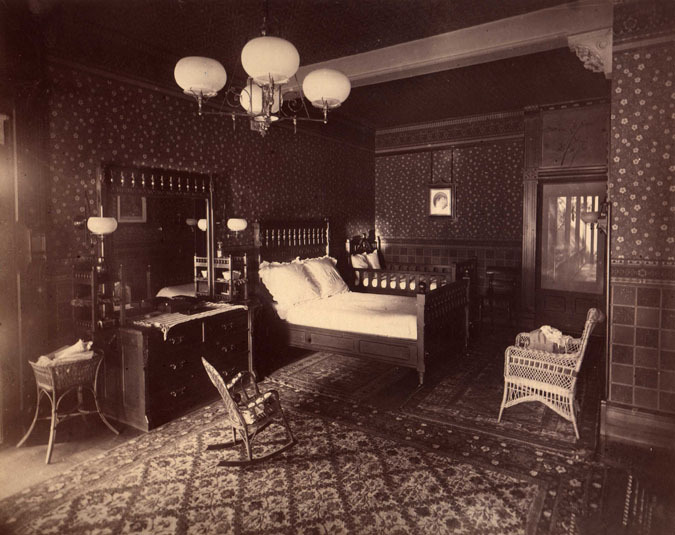 The piece, originally designed for the room in 1887, had apparently been removed by the Glessners about 1905 when John Glessner inherited his parents’ 1830s Empire sofa after the death of his father. We felt that the recreation of this piece was essential to give the room its proper appearance. Long-time volunteer Robert Furhoff, who specializes in historic interiors, spent many hours researching the appropriate construction and fabrics, resulting in a piece that would fool even the Glessners. Scott Chambers of Fine Woodworks Inc. and Gonzalo and Anna Gamez of G&A Upholstery produced a truly beautiful and unique piece of furniture. Many other small details required attention as well. The drapery rods could be found fairly easily, but the original brackets were heavy and unique in dimensions, requiring the careful attention and craftsmanship of master metal smith John La Monica. The gold leafing of the various elements of the wood trim had deteriorated significantly over the years, and was replaced by Lee Redmond Restorations, who also undertook refinishing of damaged wood mouldings, and refreshing the trim throughout. Jeffrey Ediger of Oak Brothers refinished the surviving metal pieces. An enjoyable part of the project was bringing the room all back together. This involved a careful analysis of the historic photos of the room, identifying objects that were currently elsewhere in the museum that needed to be returned to the space. All of the physical work needed to actually restore the room has been undertaken in just four weeks starting with the removal of the old wall covering on September 19th. An outstanding team of craftsmen kept the project on track, so that we only needed to close the room to the public for a little under one month. As we get ready to unveil the room, a moment to thank those whose generosity has made it possible. As mentioned earlier, Aileen along with her family and friends, spearheaded the project, keeping it in the forefront as we set out goals for the museum. The passing of Bunny brought not only her bequests but additional gifts from her family and friends. 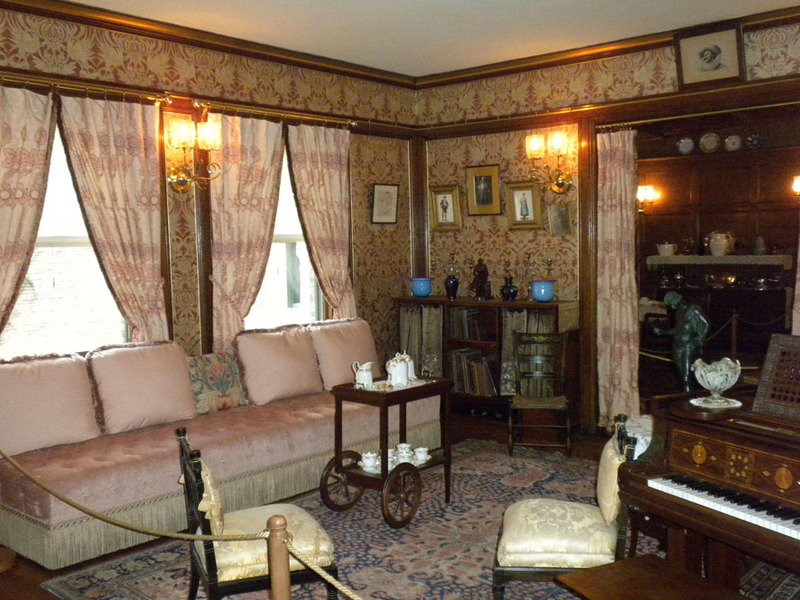 As the project grew, the museum approached the Richard H. Driehaus Foundation who generously provided additional support, primarily to produce the Morris draperies. Finally, when the decision was made to recreate the banquette, an anonymous donor stepped forward with a generous gift to our 125th anniversary fund, which was applied for this purpose. Lastly, many of you contributed to this project as well. The remaining funds needed to complete the room were taken from our House and Collections Committee Fund, which is supported by the proceeds from the various private tours and events held several times per year, and which many of you have attended. At this time, I would like to ask Ruth Mandel to step forward representing her mother Aileen. She is accompanied by her brothers Mark and Eric. In just a moment, Ruth will be asked to cut the teal ribbon on the left doorknob of the parlor. Teal is a special color for Aileen – it is the official color for the fight against ovarian cancer. I would also like to ask Dina Krause to step forward representing her cousin Bunny Selig, accompanied by Dina’s husband George and their daughter Sydnie. Dina will be asked to cut the purple ribbon on the right doorknob of the parlor. For all of you who knew Bunny, there is no need explain the significance of the purple ribbon. (At this point, the ribbons were cut, the room was opened and attendees had their first glimpse to view the Glessners’ parlor as it appeared in 1892. Following the viewing of the room, the group reassembled in the coach house where John Waters delivered an informative presentation on decorator William Pretyman).